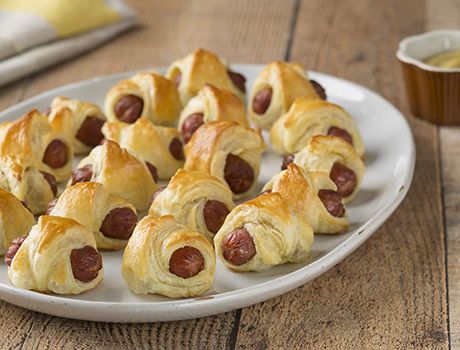 Whether youre tailgating, at a fancy party or a casual get-together, these pastry wrapped sausages never seem out of place. 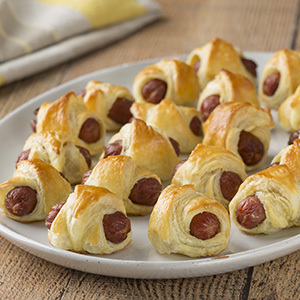 Puff pastry bakes up flaky every time and is the perfect complement to smoky sausage. You can stick with traditional mustard and ketchup for dipping or try serving with hot queso dip, barbecue sauce or sriracha. Sprinkle the flour on the work surface. Unfold 1 pastry sheet on the work surface. Roll the pastry sheet into a 10x14-inch rectangle. Trim a bit off the edges to make sure they're straight. Cut the rectangle into 7 (2x10-inch) strips. Stack the strips on top of each other, making sure to match up the edges. Place 1 piece of pastry on the work surface, with a pointed end facing you. Place 1 sausage crosswise across the center of the pastry. Brush the pointed end farthest from you with the egg. Starting at the end closest to you, roll the pastry around the sausage and press to seal. Repeat with the remaining sausages and pastry. Place the wrapped sausages onto the baking sheets. Brush with the remaining egg. For additional flavor and texture, after brushing the unbaked pastries with the egg, sprinkle with sesame seeds, poppy seeds and/or sea salt or finely shredded Cheddar cheese, then bake as shown. Or try brushing on some sweet pickle relish, it bakes up like little pickle chips on the outside! Ingredient Note: The number of cocktail smoked sausages in a 14 ounce package may vary, so don't worry if the pieces of pastry and the number of sausages don't match exactly.